HOK developed a master plan for Kaiser Permanente’s Redwood City Medical Center and designed the first-phase hospital replacement project. HOK’s campus master plan provides a gateway to Redwood City’s central business district and pedestrian links from the CBD to major streets and public transportation. Our plan restores the Redwood Creek embankment and creates a major public open space at the heart of the campus. The first phase of the master plan provides for a new replacement hospital, a new central utility plant and associated parking. The project includes the renovation of the entry to the existing hospital and new outpatient facility and upgrades to the utility infrastructure that will set the stage for future campus development. The bonded brace frame construction prevents structural steel from bending and failing in an earthquake. 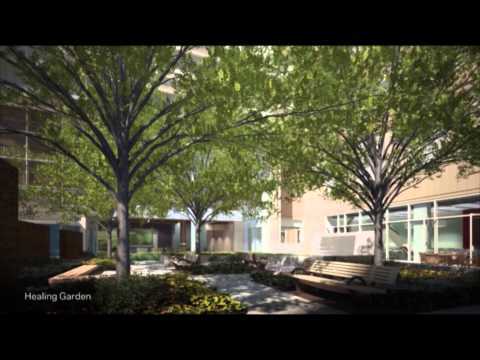 The new hospital includes an enclosed garden featuring outdoor dining adjacent to the cafeteria and a meditation area. A water feature in the garden sends a gentle flow of water over a wall of stone separating the quiet seating area from the busier pedestrian paths and outdoor dining. The garden is planted with native and indigenous trees, shrubs and perennials that are non-allergenic and non-toxic. 283,100 sq. ft. / 86,300 sq. m.
Take a tour of Kaiser Permanente’s new replacement hospital under construction in Redwood City, Calif.